Bengaluru. 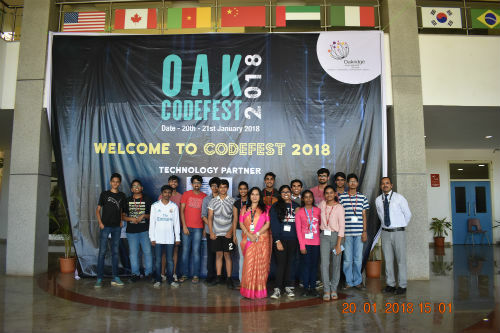 Oakridge International School hosted a two-day event, Codefest 2018 on January 20 and January 21, 2018 at its Bangalore campus. The Codefest 2018 was Bangalore’s first overnight school coding event, designed to provide opportunity for young students to showcase their unique talent to the industry veterans. IBM was tech partner of the event. Technology leaders namely, Hackerearth, Tech Domain, Hackveda and Digital Ocean supported the Codefest. Total 53 students from schools like The International School Bangalore, Stonehill International and DPS participated in the competition. The event also provided an opportunity to the students to take part in workshops such as Minecraft and IoT conducted by industry veterans. The themes for this year were Internet of Things, Education Innovation, and Environment & Sustainability. IoT is one of the most progressive and ground breaking fields in our current time, making this an excellent theme to tackle. Participants had to use physical devices on a network to innovate in fields such as home automation, wearables, smart vehicles, etc. Education as a theme creates a collaborative platform for students, designers, developers, and schools to innovate. This year’s focus was on building solutions for today’s education related problems and implementing creative ideas and solutions in the form of prototypes through a multidisciplinary approach. Sustainability and the environment are great concerns that need to be addressed. Participants were expected to come up with ideas to solve these problems, either by improving existing technologies or coming up new ones by using the skills and tools that they have at their disposal. Some of the topics of interest in this theme include the pollution of affected lakes, long periods of gridlocked traffic jams and smog problems in Delhi.